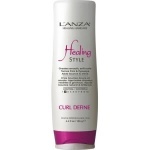 Lanza Healing Style Collection formulations contain a brilliant blend of advanced technology and natural ingredients to create and maintain fashionable hair designs. Keratin Healing System improves styling control and hold. colour Preservers provide longer-lasting haircolour. UVA / UVB / UVC Protectors prevent sun damage, while Thermal Guard saves hair from extreme heat. Rainforest Botanicals naturally deliver shine and hold. Hairstyles are guaranteed to last longer. Lanza Polyester adds a glistening sheen to the hair while providing strong and resilient support with touchable movement. L'Anza Healing Style Molding Paste provides the essential design support for creating unique, urban hairstyles. This lightweight cream expertly enhances texture and smoothes natural curls or curling iron sets. Curls are perfectly aligned and frizz-free with renewed bounce and luster. Lanza Design Foam provides flexible support with touchable softness and a rich and creamy formula that gives extra body and fullness. Lanza Powder Up Texturiser allows natural movement and separation and does not make the hair stiff or sticky but lasts throughout the day. Now regardless of your schedule, location or the weather, you can enjoy a fresh from the beach look year around. Lanza Dramatic FX provides volume and control with a superior hold without stickiness and imparts incredible shine. Lanza Design FX is a versatile working spray and light finishing spray. Lightweight and flexible, it is great for use with blow dryer, curling irons or flat irons. Lanza Shine FX creates a shiny, glossy finish to the hair with this lightweight aerosol to enhance shine and illuminate haircolour. Lanza Spray Gel is an ultrafine, lightweight mist that disperses evenly, delivering abundant support, body & shine. 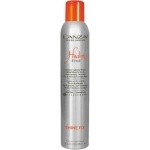 Lanza Ultimate Gel is a hard-hold gel to deliver strong support to the hair. L'Anza ega Gel when blow drying or for naturally sculpted styles by simply applying a small amount to your damp, towel dried hair. Lanza Healing Style Ultimate FX is the ultimate hold finishing mist. This healing hairspray provides utmost, intense hold for lasting style and finishing effects.